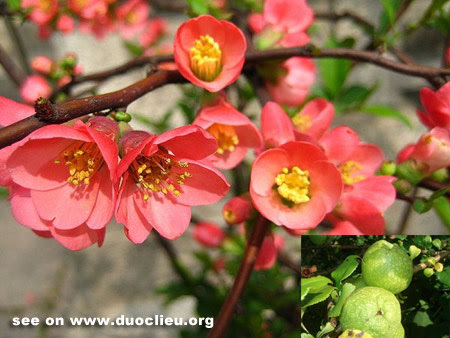 Common Name: Chaenomeles fruit, Flowering quince fruit, Chinese quince. Part Used & Method for Pharmaceutical Preparations: The fruit is gathered in summer or autumn when it is ripe. Then it is halved, soaked in hot water, dried in the sun and cut into slices. 1. Convulsions and spasms. Chaenomeles fruit (Mugua) is used with Frankincense (Ruxiang) and Myrrh (Moyao) in the formula Mugua Jian. 2. Painful and swollen legs with irritability. Chaenomeles fruit (Mugua) is used with Evodia fruit (Wuzhuyu) and Areca seed (Binglang) in the formula Jiming San. 3. Wind-damp obstruction syndrome manifested as rheumatic pain, numbness of limbs and joint pain. Chaenomeles fruit (Mugua) is used with Tetrandra root (Fangji), Clematis root (Weilingxian) and Chinese angelica root (Danggui).